Immune response. Light micrograph of phagocytes fighting liver infection by proteus bacteria. Several phagocytes are visible as orange cells with dark granular cytoplasm. The red circles are the nuclei of irregular shaped liver cells (hepatocytes). White channels of blood vessels (sinusoids) are visible at lower right and upper left. Phagocytes are white blood cells able to engulf and digest bacteria. 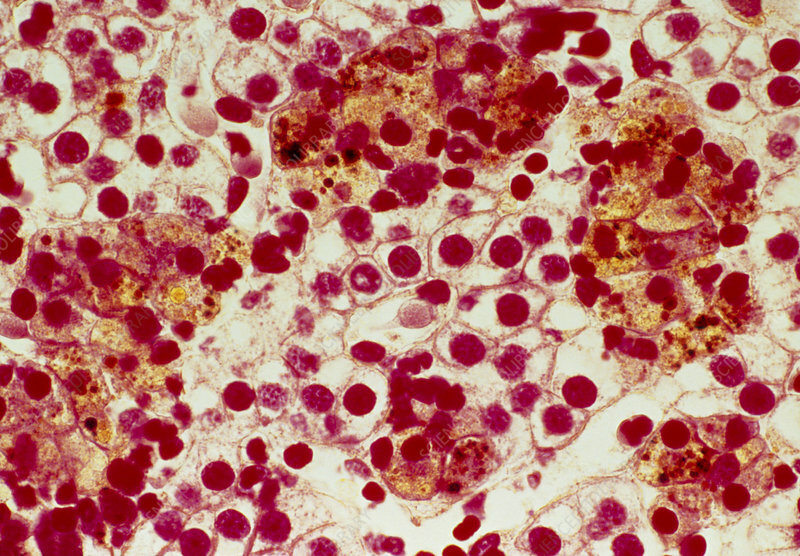 Most phagocytes found in the liver are large macrophages. Proteus is a gut-dwelling bacterium which can cause liver infections. Magnification: x100 at 35mm size.